The Wales Air Ambulance Charity has permanently relocated its paediatric and neonatal operation to a new base in Cardiff from today (Monday 4 December). Children’s Wales Air Ambulance is a specialist division within the charity, which is dedicated to transferring vulnerable babies and children to hospitals across Wales and further afield. The helicopter charity launched a seven-day transfer service with its fourth aircraft earlier this year, making it the largest air ambulance operation in the UK. It has been based at Wales Air Ambulance’s headquarters in Dafen, Llanelli while the crews prepare a new, permanent base at Cardiff City Heliport on Foreshore Road. The new operation in the Welsh capital is the most advanced air ambulance service for paediatric and neonatal transfers in the UK, with a pioneering flight incubator system and Britain’s only dedicated helicopter transfer practitioners (HTPs). 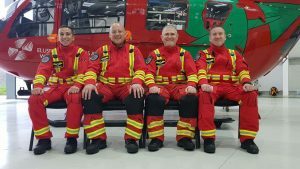 HTPs Dewi Thomas, Jez James, Steffan Simpson and Andrew Morris will be stationed alongside four pilots at Cardiff Heliport, on standby to help move patients between hospitals when they need specialist care. The crews come from nursing and paramedic backgrounds and have undergone intensive air ambulance training over the past two months. 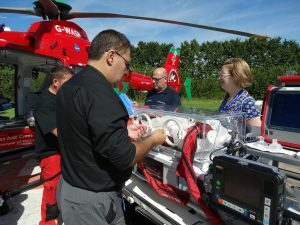 They work closely with paediatric services including WATCH and NWTS, and the neonatal transfer team CHANTS who helped design Wales Air Ambulance’s flight incubator. Operations manager Mark Winter said: “Moving permanently to our new base in Cardiff is a huge step in developing our Children’s Wales Air Ambulance division. We are now much closer to the Children’s Hospital for Wales and we have dedicated space and facilities for this very unique operation that we run. “We can fly new-born babies and children to any centre in Wales and beyond, including Great Ormond Street and Alder Hey. This can make a vital difference to a poorly child who needs treatment or surgery, saving hours if they had gone by road. It also means the very specialist doctors and nurses we work with in hospitals are back in their wards and helping other children much faster. Children’s Wales Air Ambulance (CWAA) is a division of Wales Air Ambulance which is dedicated to the specialist care needed for paediatric and neonatal patients. It is funded entirely by the charity. The CWAA aircraft is used primarily to transfer children and babies, but also has the capacity to transfer adults who need care in another hospital. Wales Air Ambulance also operates three HEMS (helicopter emergency medical service) aircraft across Wales from its bases in Caernarfon, Welshpool and Llanelli, responding to people of all ages suffering life-threatening illness and injury 365 days a year. 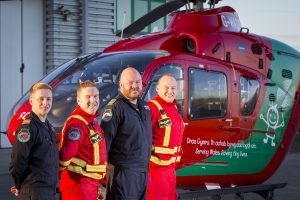 The charity is the only air ambulance service based in Wales, and relies entirely on donations to raise £6.5 million every year to keep its four helicopters flying. Andrew Morris is a qualified nurse and helicopter transfer practitioner on board Wales Air Ambulance’s transfer aircraft. Specialising in adult and paediatric emergency and critical care, Andrew was a resuscitation practitioner at the University Hospital of Wales, Cardiff for 11 years. As an advanced paediatric life support instructor, he taught staff how to resuscitate and treat children, particularly with multiple trauma. A Major in the Army Reserve, Andrew was an intensive care nurse in Iraq in 2003 and then, five years later in Afghanistan, was second-in-command of the Emergency Department at Camp Bastion. Andrew also volunteered for 17 years with Mountain Rescue, working closely with the RAF and clocking 250 hours on the Sea Kings. He was awarded an MBE in 2007 for his services to Mountain Rescue and the Army Reserve. Joining Wales Air Ambulance as an HTP, Andrew said: “I saw this as a chance to join a fantastic organisation and put my skills and experience to work in a different environment. For more information, visit walesairambulance.com.